Along with the sheet music there's the basic letter notes which can be used by flute or recorder players, along with the mandolin tab. This was a big hit for the Clancy Brothers And Tommy Makem plus a rake of other folk singers. It was also recorded by Ed Sheeran. The sheet music on this page. 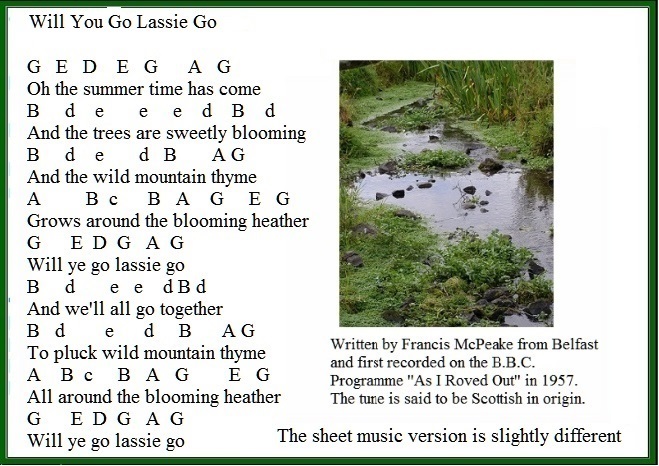 You may have noticed that the two pieces of sheet music here are slightly different to one another. They both start off on the G note but one version goes low after playing the G and the mandolin piece below goes higher after playing the G. It's just a different way of playing the song and it's a matter of choice really. In the youtube video I'm playing tin whistle version which is also the same as the letter note version. In the easy to follow letter notes above, [ suitable for recorder and flute ] the low notes are the CAPITAL LETTER up as far as B, and the high notes are the letters past B. This is the format I use in the tin whistle book.